For one day every year on the planet Tenalp, everything is backwards. Everything. So why didn't Andrea turn into a boy on Backwards Day this year? And why did she turn into a boy the very next day? 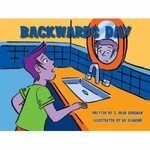 Berman, S. Bear, "Backwards Day" (2012). DIVerse Families. 48.